During the roof and oculus replacement, the building’s interior was vulnerable to weather conditions. Inside the Dome Room, 48-foot-high scaffolding gave workers access to the oculus (the skylight) and helped support a synthetic rubber “bathtub” that captured any intruding water and debris, which was pumped away without damage to the building’s interior. 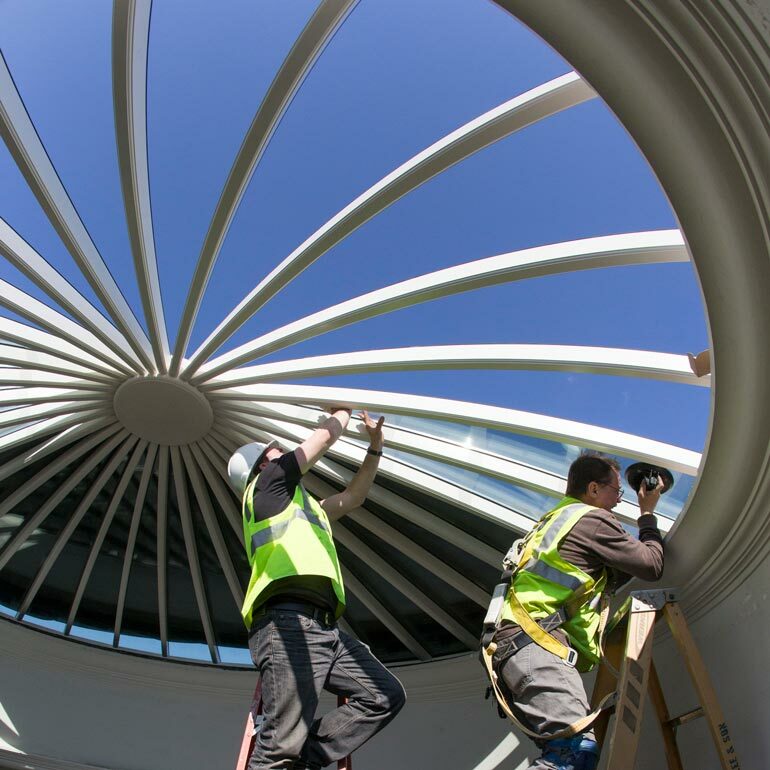 Hoisting more than two tons of glass to the top of the dome posed a significant challenge: working together, two installers bolted a winch to the scaffolding and secured suction cups to the glass to carefully raise each 127-pound pane to the oculus. The etchings on the glass are representative of Jefferson’s original oculus, which was made with smaller, overlapping glass shingles because the technology did not yet exist to make the large panes that are used today. The approximately 2.5-inch overlap of the glass shingles is represented by a silk-screened pattern on an interior layer of the insulated glass. Inside the Dome Room, crews removed the patchy plaster ceiling and the perforated, sound-absorbing metal panels behind it. While the panels effectively dampened echoes during big dinner parties and other events, the ceiling wasn’t very smooth. The inside of the original dome would have been a smooth, white plaster, so crews tried to achieve that look while preserving the acoustical properties of the metal panels. Workers first cut rectangular pieces of porous backing board to fit around the curved surface of the dome ceiling. 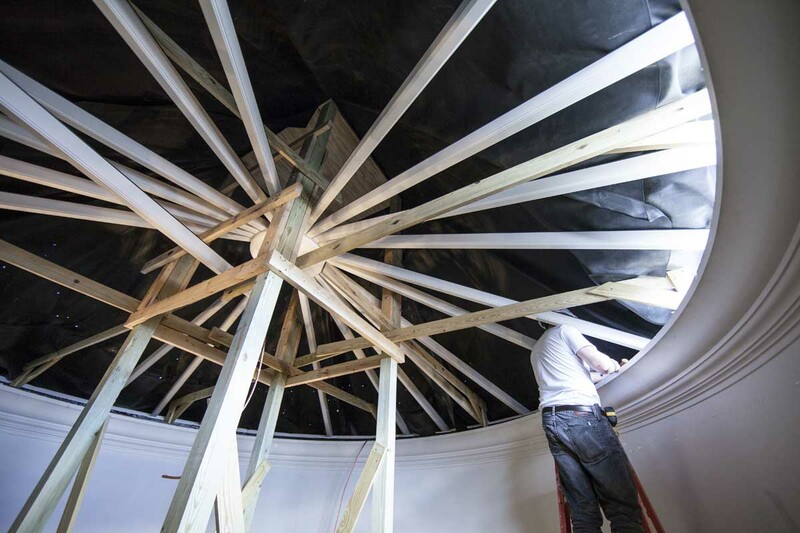 Metal channels hold the backer board a few inches off the terra-cotta dome, giving some air space between the plaster and the structural dome. Then, workers painstakingly applied a perforated, acoustical plaster to the backer board and covered the plaster with a very thin finish to achieve a smooth, rounded look. The plaster will work to manage noise in the room, but it won’t reduce all of the echoes in the room; the Whispering Gallery still works.